An excerpt from a list in a document. 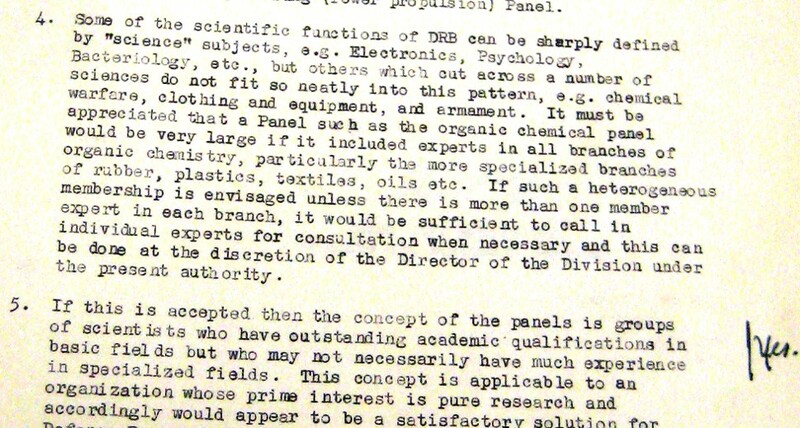 Items four and five are depicted and they discuss the priorities when selecting members of the Defence Research Board such as gaining members which cover a variety of wide science topics, not necessarily highly specialized members. Created by Glen Gay the Director of the Laboratory of Chemical Warfare for the Defence Ministry of Canada. Glen Gay, “Proposed New Organization of Advisory Committees and Panels of the DRB,” Exploring Greenland, accessed April 19, 2019, http://exploringgreenland.org/items/show/16.